AFLPNG’s under 14 Coca-Cola Binatangs will depart this Thursday for the Gold Coast in Queensland to participate in the 2013 Queensland State Championships. The squad of 27 Young boys has been drawn from the Highlands (Goroka and Mt. Hagen), Islands (Kimbe/Hoskins and Kavieng) , Northern (Lae and Kainantu) and Port Moresby. Selection was via the Coca-Cola National Championships held in November last year at Lae’s Igam Barracks. Squads have been preparing in each of the regions since February for the big trip. High hopes are held for a strong performance, with Assistant Coach Mesea Dorogori declaring the boys as equal to any side he has travelled with before. Dorogori said: “Our preparation this year commenced early and our selection process was strong. We have won this carnival before and believe we are a good chance of following the success of the under 16 Coca-Cola Binatangs who won the South Pacific Cup in Townsville in April”. “The Australian teams have an advantage in that they live close together and have been able to train and play as a group. We will compensate for that with some practice matches and the boys will spend 10 days together in a camp and education environment”. The Meli name continues in AFLPNG history with the son of Mosquito legend, the late Peter Meli, being selected to travel. Peter Meli junior comes from Lae, and his brother David Meli was of course on an international scholarship to the Essendon Football Club in Melbourne. AFLPNG General Manager, Murray Bird said: “This trip represents the first step in the Coca-Cola talented player pathway for PNG youth. It will be a fantastic learning and life experience for the boys. Many have not been on a plane before. 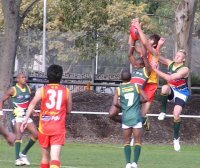 They will play in a good football competition, experience the Gold Coast, engage in player education sessions, and train and generally have the time of their lives”. “Who knows, one or two might be noticed by an AFL club and start a career similar to Mt. Hagen’s Gideon Simon who is currently contracted to the Richmond Football Club in Melbourne. It all begins here, and we hope all the boys play well and represent their country with pride”.